Happy Holidays, everyone! All the best wishes to you in this time of the year where some of us Christians celebrate the birth of Jesus, while others share love and hope with their family and friends. May your days be merry, bright and joyful all year round~ I have had an amazing Christmas joining the choir during the midnight mass celebration, having parties and presents, laughing with my family and having a lot of good food. In case you're wondering, the nail designs are NOT by me, but my amazing sister Jen. She's been picking up her nail art brush during this Winter break and kindly gave me some snowflakes and snowmen. Aren't they adorable? I heard that Tom Ford is now sold in Hong Kong at limited department stores or shops; have not had the time to visit those yet, but I finally have the opportunity to play with the goodies my girlfriend got me from UK - I have been saving them for special occasions, and what time in the year can be more special than Christmas? As I wore this look from 6pm to 2am, I need something that will last and not worry me with smudging or melting. On the other hand, I want sparkle but not something too loud for I'll be spending a good amount of time in the Church. So I settled for some light golden shimmers and easy berry lips/cheeks. The two glitter shadows in the Tom Ford Eye Color Quad are indeed grown-up glitters. I applied the light brown taupe shade all over my lid, and pressed the two glitter shades on top - lighter on the 'eyeballs', darker near the outer corners. They stick all day/night and they shine. Feels so comfortable on, and I do not regret getting this palette just for the glitters! Frantic Pink, the Cheek Color is a spectacular peachy pink. The shimmer infused is ultra-fine, not accentuating pore issues at all. Lasting power is impressively strong and I can still see color on my cheeks at 2am! Besides Tom Ford, there are also some honourable mentions. Skindinavia setting spray helped a lot to make my foundation and concealer to hold. Nars Pro Prime Eyeshadow Base is a great primer, although I have to remove the divider/stopper thing in order to get the product out. Wearing Kiss Me Volume and Curl over Long and Curl is my current go-to mascara combo. This was my first time putting the Make Up Forever Aqua Brows on, and it went pretty fool-proof - the key is to use the tiny bit as most bloggers said. Read everything I have used on my face below! The last pic is definitely a 10 years sillier expression! 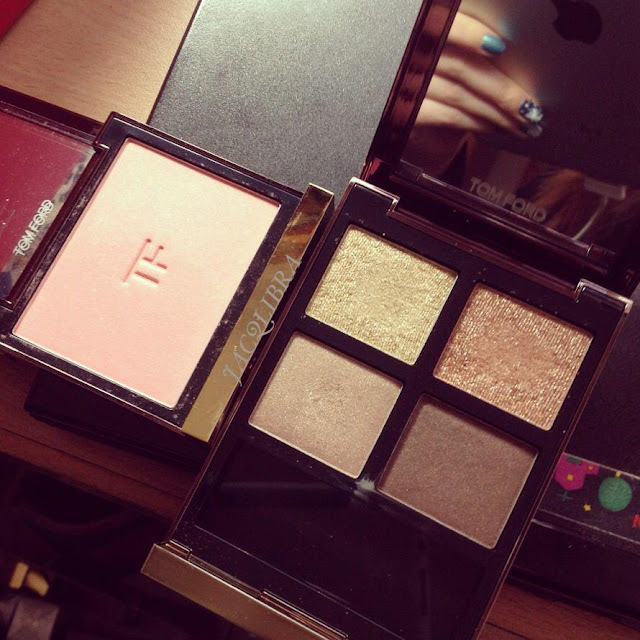 Gorgeous colors in that Tom Ford palette. I don't use his stuff, but they look really pretty on you. Yay to Tom Ford coming to Hong Kong. Also, is that a new blog header? LOVE! Beautiful... and I loves me some TF! I am avoiding the counter(s)! BUT, which one did you go to? ah you look so beautiful!! Merry belated Christmas love! I hope you are having a wonderful break. Tom Ford's makeup is so stunning right?! Its definitely has a finesse that can't be found in other luxury brands. Their lipsticks are also amazing!! Thank you Kate :) heading over now!